These connote positive thoughts such as relaxation, hanging out, and having fun. And such a word is appropriate this season, because “to chill” is the best thing to do this summer. The heat of summer provides more reasons to celebrate life—it gives you more ways to enjoy and relax. On top of the list is hitting the beach. It’s the best time of the year to enjoy the wonders of the country’s islands and explore its magnificence. Bonding with family and friends or your special someone can make the experience even more enjoyable. With summer comes the scorching sun and for those who would like to enjoy the sunshine with less heat, best option is to head off to the mountains of the Cordilleras and take pleasure in the summer breeze. Trek, hike, harvest strawberries, or simply tour around the City of Pines—take your pick! Meanwhile, those who are out of budget for an out-of-town getaway can always go on a “staycation” mode. How about a barbecue party? With less chances of rain, the season is apt for any outdoor activity at home like barbecuing where you can marinade the best meat you can buy and grill your way to fun, gastronomic, bonding. Whatever your escapades may be, the real objective is to relax and make the best memories out of your summer adventures. It is also important to make sure that every activity is perfectly paired with refreshment that guarantees chill this summer. “We believe there’s a reason to celebrate life every day. The beauty and warmth that summer gives are more than enough to be happy about life. This is why we bring the perfect companion for making every moment this summer even more special,” says Von de Torres, Managing Director at Emperador Distillers. Emperador Distillers brings Rossi Sweet Red, a sweet red wine crafted from grapes grown in California’s sun-drenched vineyards and bursting with flavor and aroma. It has layers of vanilla, bright cherry and wild raspberry flavor creating a different kind of sweetness. Rossi on-the-rocks unleashes the best taste in Rossi Sweet Red where the ice brings out the flavor and makes for a smoother finish. It doesn't compromise the taste and even brings out the best in wine. 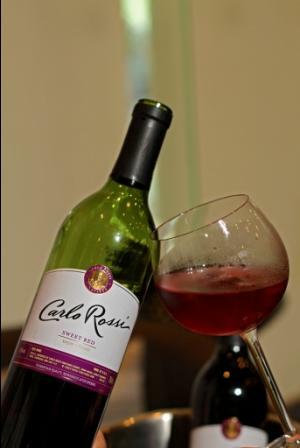 Even when the ice melts, the taste stays perfect allowing you to savor the sweetness in real red wine.